I am kind of over pumpkin. ‘Tis the season for the pumpkin latte, pumpkin cheesecake, pumpkin mac and cheese, pumpkin oatmeal, and pumpkin EVERYTHING. I swear if I see another pumpkin recipe I may start punching things. It isn’t that I dislike pumpkin – in fact I really like it – but SO many people have jumped on the pumpkin bandwagon this year I fear we have reached critical pumpkin mass! I have never been much of a joiner, band wagon jumper, or trend follower so if I see the crowd saying pumpkin I say … butterscotch! And chocolate, and cheesecake, and cookies! Yes, I want to have it all, as long as it isn’t pumpkin. That’s how I roll. 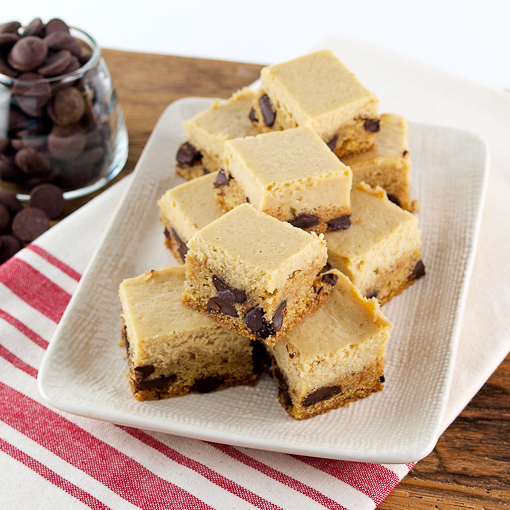 This cookie/cheesecake mash-up was inspired by my love of brown sugar. That stuff is like magic because it imparts lovely caramel notes to whatever it is added to. Don’t believe me? 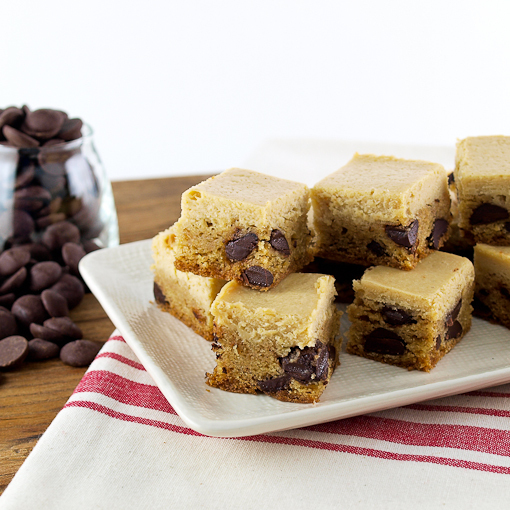 Try making chocolate chip cookies with white sugar only. Hint – BORING! 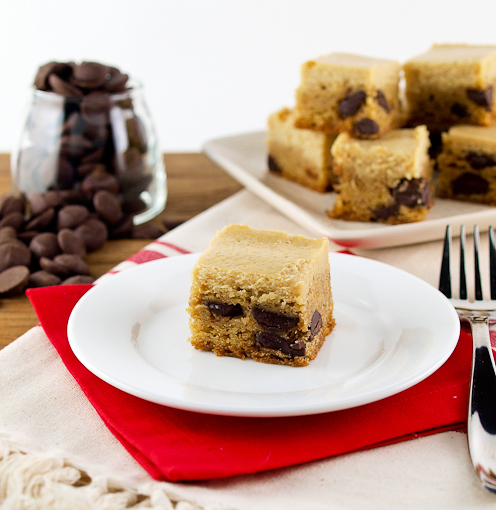 These bars use brown sugar to maximum effect in both the base – a moist and chewy chocolate chip pan cookie – and the creamy cheesecake topping. A few things I think you need to know about this recipe, in no particular order. First, I recommend you really blend the cream cheese and brown sugar VERY well when making the topping. You want the topping to be silky smooth, and the only way to achieve that is to make sure every last crystal of brown sugar has dissolved. 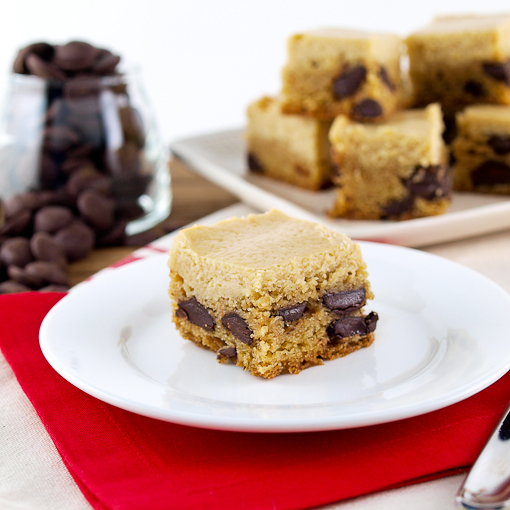 Second, bittersweet chocolate chips make a superb contrast to the sweetness of the cheesecake and cookie, but if you prefer another kind of chip feel free to use it. Finally, there is no need for a water bath for this recipe, but if you are worried about the cheesecake topping cracking add a glass pie dish filled with 1/4 cup water to the oven while it heats. The steam it creates will provide extra anti-crack insurance – but I did not have any issues with cracking so I would not concern myself with it too much. These are a lovely little dessert or snack, and you can gussy them up with a drizzle of chocolate if you want to make them even fancier. 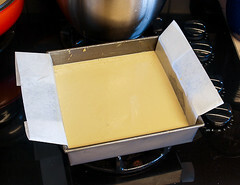 Heat the oven to 350 F and spray an 8×8-inch square pan with non-stick cooking spray. Line the pan with parchment paper, leaving a three inch overhang on either side of the pan, and spray the paper with non-stick cooking spray. 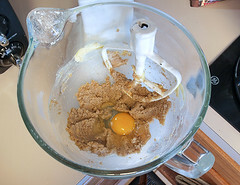 In the work bowl of a stand mixer, or in a medium bowl with a hand mixer, beat the butter, brown sugar, and sugar on low speed until well combined but not fluffy, about 1 minute. 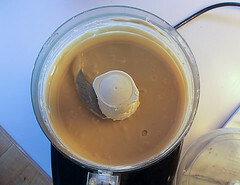 Add the egg and vanilla and mix until the mixture is smooth. 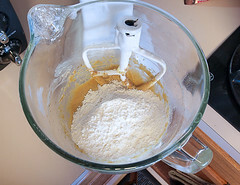 In a separate bowl sift together the flour, baking soda, and salt. 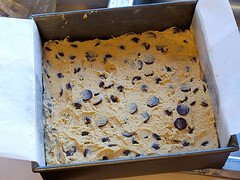 Add the sifted dry ingredients into the butter mixture and beat on low speed until the flour is just combined, about 30 seconds, then add the chocolate chips and mix until the chips are well distributed, about 30 seconds more. Press the dough evenly into the prepared pan and set aside. 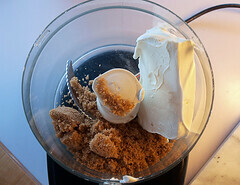 In the work bowl of a food processor combine the cream cheese, brown sugar, and cornstarch. Process until the brown sugar has completely dissolved, about 3 minutes, stopping occasionally to scrape down the sides of the bowl. Add the egg, sour cream, and vanilla and process until well combined, about 30 seconds. 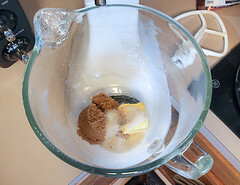 Pour the cheesecake mixture over the top of the bars. Rap the pan lightly on the counter to release any air bubbles. 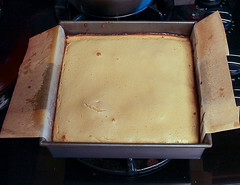 Bake for 30 to 40 minutes, or until the cheesecake is firm at the edges but the center is still slightly wobbly. Remove the pan from the oven and cool completely to room temperature, then chill for 4 hours or overnight. Once chilled use the excess parchment to remove the cookie from the pan. Cut into 16 pieces.